Recently I was strolling round Boots and noticed my favourite word on a certain price label - "clearance". Jeez I love a bit of discount or a total Barry bargain! These 2 products were down to just £1 each so of course without thinking they were in my hand and I headed to the till! £1 each for a perfect handy travel sized hair oils? That's a total bargain right? I'm a sucker for hair oils, if you've read this blog for a little while you will know this and be saying to yourself - really Kirstie? more hair crap? - but yes! I cannot refuse things for £1 it would be just plain rude! Obviously I wasn't expecting the worlds greatest hair oil for this price but there was no harm in giving them a go - and I have to say I have been pleasantly surprised! The top thing about this product - the scent. It has a lovely vanilla smell to it, alot of other oils I've used don't really have a smell so it was so nice to use one with a nice sweet scent that I didn't mind running through my hair both day and night. These are only 5ml so they aren't going to last months but you don't need alot at all as only a small 5p size will do to get through your mid-lengths to ends. Saying this the only problem with these bottles is the way you distribute the product - it's hard not to tip out too much as there isn't a pump or small hole to get the product from. So you've got to be careful when tipping it out! The oil has left my hair feeling soft and smooth and definitely given it a pretty shine. 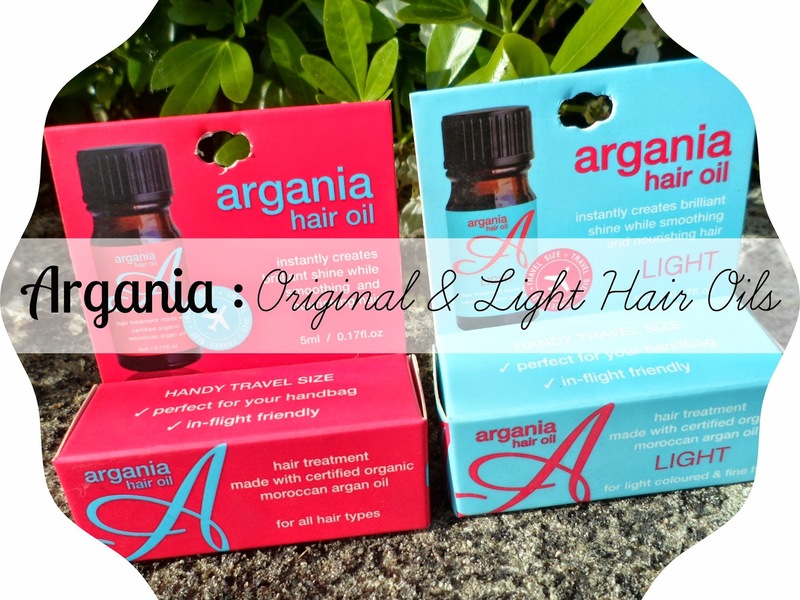 The 'light' version of the Argania oil hasn't been too different for me. I can tell in the product itself is different when looking and feeling it. It is slightly lighter in colour and feels thinner but the effect it has on my hair isn't much different to the original. The light oil is for people with lighter coloured hair or fine hair - so if your hair is white/blonde and really thin/fine this is the stuff for you. Like I said before it isn't as thick as the other oil so will be alot easier to work through thinner hair and will help avoid build up - but for me, they work just as well as each other. The light oil also has the lovely vanilla scent, so still winning there! These are perfect for carrying round in your handbag or if you are going away for a few nights - hair oils are a must for summer, no-one wants dry, thirsty hair! Have you tried either of these yet? There are more products from this range which I am now dying to try.... anyone used them? I love these oils, I tried the light one myself and have been so impressed with it. I didn't know they did mini versions, I'll have to keep my eyes peeled! Thanks for sharing, you have a lovely blog! Keep away from indoors components for example reel in compartments & zips. chanel replica sale Provide compartmentalizing in several accoutrements & skin care to help you Credit & kickback business cards. chanel replica sale Choosing a exact sort of components for one's caddy backpack is an excellent plan that will to help make people proclamation. louis vuitton replica sale You can get caddy plastic bags at a broad variety in design for illustration nylon, canvas, fabric, wash rag and even suede. dior replica sale An important designed caddy backpack through different visuals expands your special proclamation. Aluminum fabrics might make it easy for an important image as being a very good differentiate yourself! louis vuitton replica sale Like a canvas textiles along with a permanent magnetic reel in hold in cases where you need an exceedingly cool and even invaluable caddy backpack.